Trio Noir is a newly formed ensemble studying at the Eastman School of Music. They have received coachings from Mikhail Kopelman, the former first violinist of the Borodin Quartet, as well as Steven Doane and Natalya Antonova. Most recently, Trio Noir has been under the guidance of Margery Hwang. In the spring of 2014, the ensemble performed in Eastman's Kilbourn Hall for a scholarship recital. 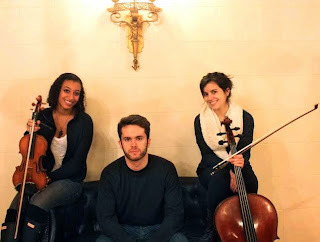 Recently, the trio has been chosen to perform in the school's Honors Chamber Music recital. David, Carmen, and Laura are all juniors working toward their BM degrees in performance.